The smart phones have given people the opportunity to access the website through mobile. People use Mobile Phone frequently for website browsing. The sudden increase in Internet surfing through Mobile Phones leads to design Mobile compatible websites. We use all the existing operating systems so that your mobile website becomes compatible on different platforms. SKN InfoTech offers mobile website designing services to our esteemed customers. We have an experienced team of mobile developers. We carry out full analysis of the existing website and finalize the important topics. 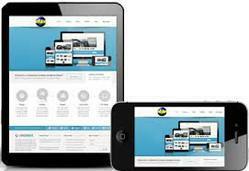 We develop website content to fit in most mobile browser. The mobile website we design can easily be accessed on mobile phone browsers including the smart phones like iPhone, BlackBerry, Nokia etc. This implies these mobile websites are compatible for various mobile screen dimensions like 128 x 160 pixels, 176 x 220 pixels, 240 x 320 pixels and 320 x 480 pixels.